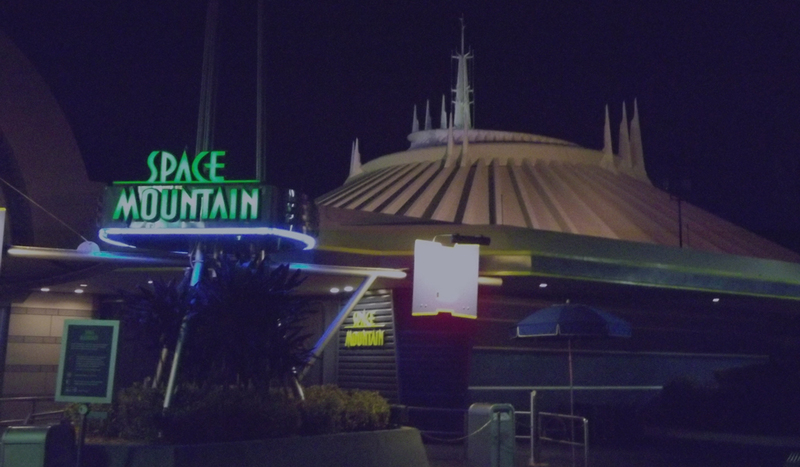 The queue for Space Mountain zagged like a corn maze. Jenner’s shadow was tucked up neatly beneath his feet, the sun beating down directly atop his mouse ears. He could feel the blacktop through the soles of his shoes, heatwaves blurring the dazed expressions of adults leading their children by the wrists or their brightly-colored jumpers. It was the day before his ninth birthday. Jenner’s fingers were sticky from cotton candy, and his insides felt sticky, too. His stomach peeled away from his ribcage as he turned to watch the rockets circling above in an infinite loop. Around they went, trading altitude with one another until the rotating frenzy slowed and the rockets descended in unison with a pneumatic exhale. Jenner’s father lifted the ears from his head and tousled his hair. The frames of his father’s bifocals caught the sun and glinted in the foreground of his silhouette. When he set the ears back on Jenner’s head, his hand lingered there for a moment. Jenner leaned into the weight of those fingers. The crowd marched in slow procession, bound by some unspoken accord. Every so often, someone broke rank and ducked out of line, sighing dramatically and shaking their head, palms toward the sun. The vestiges filled these spaces hungrily and without remorse. They plodded into dappled sunlight, into shade, finally into a cool darkness punctuated by spinning planets and mapped spaceflights. Jenner shuffled toward the takeoff site dizzy with anticipation. The girl in front of him kept her eyes to the floor, a waffle pattern of dark squares and the grime of anxious passengers. At last they boarded, the safety bar ratcheting down against Jenner’s waist in a stutter of satisfying clicks. The girl with the braids turned back to look at him from her flight module. She smiled, and then her mother noticed her smiling and flicked her hard on the cheek. “We don’t stare at strangers,” she said. The girl lowered her head and her braids settled limply against the seatback. The spaceflight embarked, cranking up a dark corridor suddenly awash with spiraling beams of light. Dust motes swirled in the unbreathable air. There was no friction, no ungreased bearing or fatigued steel. The car reached the apex of its upward climb and erupted into a hollow blackness punctured by stars and spinning planets. Jenner searched for familiar constellations. He was untethered, eyes open to the universe for what felt like the first time, the vacuum of space roaring between his ears, heart pounding out its reply. And then the momentum failed. The bar at his waist was too tight as the car slowed. The planets and too-close suns hovered stillborn. The dust motes found their way back. The lights came on, and a tittering of whispers rustled through the waylaid travelers. An amplified voice crackled to life and informed the passengers the journey had been aborted. In front of Jenner, the girl’s perfect braids moved side to side. He knew her heart was reeling like his. There was no space. These were no stars. The tracks were stacked impossibly close, winding around each other like strands of genetic code, like the spaghetti of his intestines stuffed impossibly into his churning gut. The planets and too-close suns hovered stillborn. The dust motes found their way back. His father’s arm was around his shoulders, pulling him as close as the safety bar allowed. In his gray-green eyes, Jenner could sense his father’s longing to cover his own. The mother tilted her head back toward the ceiling that was not the faraway boundary of the universe. “Isn’t this how it goes,” she said. The girl cried softly. The mother eyed her sideways, shrinking back from the tears. “You’ll learn,” she said. The mother’s neck was a different color than her face. A teenager in a starched and striped shirt moved toward them. His nose was cratered with blackheads. He unlocked the safety bar of each car, the bars springing up with uninvited freedom. When he turned the key in their row, Jenner struggled to hold the bar down against his waist. His father covered his hands and gently lifted them away. He nodded, and the journey was over. Their footsteps clanged on the metal gangplank, a herd of space travelers cut loose from a failed mission. “It’s how life is,” the mother said. The girl turned her head, but did not find Jenner’s eyes. He whispered. He tried to throw his voice directly to her ear, to cut through whatever emptiness remained in this spoiled frontier. Jenner didn’t know if she heard him, but her steps seemed to grow lighter, as though she might defy the gravity on this planet at any moment, as though her feathery strides would carry her above the massy gait of her mother, braids outstretched like arms. When they stepped into the numb, white sunlight, he could almost feel the earth turning beneath his feet. He could almost feel it turning beneath them all. Jad Josey's work has appeared or is forthcoming in Glimmer Train, Passages North, Palooka, Pithead Chapel, and elsewhere. By day, he manages a company dedicated to keeping VW campers on the road to adventure. In every spare moment he can eke out, Jad writes and writes and writes.